Pineapple, also known as ananas, is a delicious tropical fruit that is surrounded by thorny spikes and topped with hard, waxy leaves that are sometimes up to thirty per fruit. The fruit is up to a foot long and has a combination of sweet and tart taste. One of the most celebrated uses of pineapple in terms of health is its ability to reduce the inflammation of joints and muscles, particularly those associated with arthritis, a debilitating disease that affects millions of people around the world. Pineapple contains a relatively rare proteolytic enzyme called bromelain, which is primarily associated with breaking down complex proteins and has serious anti-inflammatory effects. Bromelain is also positively correlated with reducing the signs and symptoms of arthritis in many. A single serving of pineapple has more than 130% of the dailyrequirement of vitamin C for human beings, making it one of the richest and most delicious sources of ascorbic acid. Vitamin C helps in reducing illnesses and boosting the immune system by stimulating the activity of white blood cells and acting as an antioxidant to defend against the harmful effects of free radicals. Free radicals are dangerous byproducts of cellularmetabolism that can damage various organ systems and disrupt function, as well as cause healthy cells to mutate into cancerous ones. The vitamin C content of pineapple defends against this. One of the commonly overlooked benefits of vitamin C is its essential role in creating collagen. This is partly the reason why it is seen as ahealing vitamin because collagen is the essential protein base of blood vessel walls, skin, organs, and bones. High vitamin C content in pineapple helps you heal wounds and injuries quickly, and also defends your body against infections and illnesses. Pineapple has been directly related to preventing cancers of the mouth, throat, and breast, as it is rich in various antioxidants, including vitamin A, beta carotene, bromelain, various flavonoid compounds, and high levels of manganese. Manganese is an important cofactor of superoxide dismutase, an extremely potent free radical scavenger that has been associated with a number of different cancers. Eating pineapples regularly can protect you from a vast amount of health conditions, includingconstipation, diarrhea, irritable bowel syndrome, atherosclerosis, and blood clotting, as well as high blood pressure. Pineapple, being rich in fiber, promotes the passage of food through the digestive tract at a normal rate and stimulates the release of gastric and digestive juices to help food dissolve. It also bulks up the loose stool, which helps in treating diarrhea and IBS. Furthermore, the bromelain in pineapple stimulates protein digestion, reduces gut inflammation, and therefore, treats digestive diseases. Pineapple is rich in both bromelain and vitamin C, therefore eating pineapple helps in preventing and treating respiratory illnesses, while eliminating phlegm and mucus from your body if you’ve already contracted an illness or infection. The immune system boosting property of vitamin C is well known, but the special enzyme, bromelain, is also connected with the reduction of phlegm and mucus build up in the respiratory tracts and sinus cavities. Along with the antioxidant compounds that protect against oral cancer, pineapple also has astringent properties, whichstrengthen gums and teeth. Astringent agents help tighten up tissues and tone the body so that tooth loss, hair loss, muscle weakness and skin loosening do not occur. 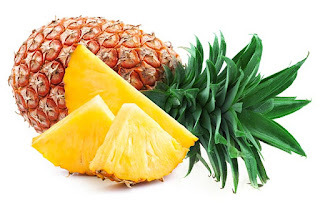 Pineapple is a very powerful astringent and is often prescribed as a natural remedy to fix the loosening of teeth or for the retraction of gums.